It’s time for the space human exploration advocacy community to get its act together. A change in U.S. Presidents, as will happen this year, almost always leads to a change in American space policy and plans. Whoever is elected this year will set the policy the country will be living with on the 50th anniversary of Apollo 11: July 20, 2019. With that reality in mind, those of us who wish for mankind to make additional "giant leaps" can no longer afford the perpetual bickering amongst ourselves that has characterized the pro-space advocacy community since about the time Neil Armstrong walked on the Moon. It is time for those of us who desire to see humans expand throughout the solar system (and then beyond) to come together, compromise, and unite behind a plan to get us again started down that path. The situation is complicated further by the very vocal disagreement between the “private” versus “public” space development communities; another distraction we cannot afford. No human has been beyond Earth orbit since 1972 when astronauts Gene Cernan and Harrison Schmitt finished their exploration of (a small part of) the Moon and departed for home. We’ve sent plenty of people into space since then, but they have all been sent to Low Earth Orbit and, as beautiful as it is, LEO is less than 500 miles from home. This is a travesty. Within the major space agencies of the world, including NASA, The European Space Agency (ESA), Russia, China, and Japan, it is assumed that humans will once again travel beyond LEO and venture to the Moon, asteroids, Mars and beyond. New Space companies, like SpaceX, make no secret that their eyes are first set on near-Earth space but their real goals lie much farther away. Elon Musk has said that he personally wants to walk on Mars. In addition to the general goal of sending people back into deep space, there is an emerging consensus that such missions are affordable and a priority for the world’s leading space powers. The Europeans are talking about a “come back to the Moon” effort that would lead to a permanently-inhabited base there by 2030. NASA has its sights set on sending people to Mars by the 2030s, with an interim asteroid visit in the '20s. China, like Europe, says it will send people to the Moon in the 2020s or 2030s. Russia, not be left behind, is reportedly developing its own plans for lunar exploration. If all the plans turn into reality, then we’ll need a robust traffic control system to keep up with all the rockets coming and going from Planet Earth. Alas, many if not all of these plans are likely just optimistic dreams. Building Moonbases and rockets to carry people to and from Mars requires money and a time commitment that is far longer than the typical election cycle. Doing what Americans often do, let’s for the moment ignore the rest of the world and think about American space priorities, public and private. If we all agree that we should be sending people beyond LEO, then where should we go? With public opinion widely supportive of space exploration, surely we can get behind a plan to send people to [X]. (Fill in your favorite destination here.) And therein lies the problem. The American space advocacy community cannot seem to agree and unite behind a single next destination. 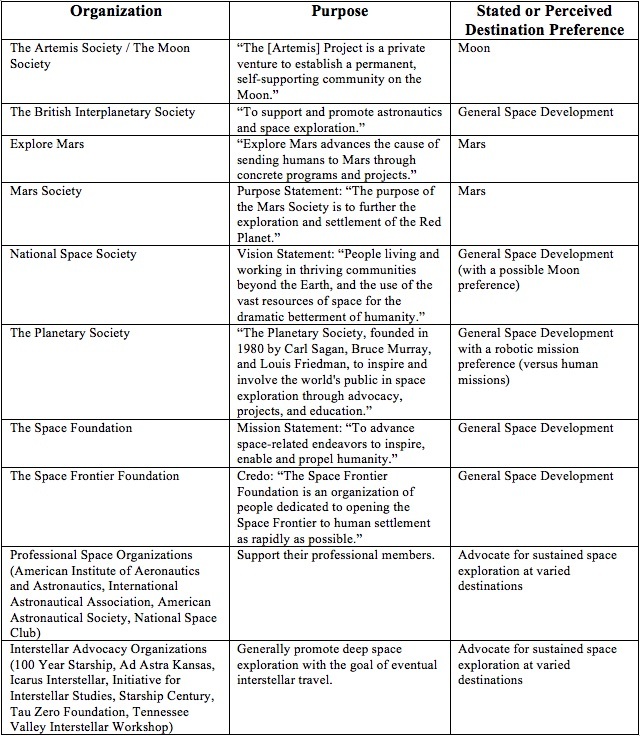 Instead, multiple groups are out there, pushing their own competing visions, while our real progress toward deep space remains largely in “neutral.” For a partial list of space advocacy organizations and what I perceive as their destination goal, see Table 1. Table 1. Notable space advocacy organizations and their goals. Note: The quoted purposes/goals come from the websites of the listed organizations. Man has not yet traveled into space more than 200 miles from the Earth’s surface and it will be some time before an astronaut or a cosmonaut steps out of a spacecraft and stands on the surface of the Moon, which is only 240,000 miles away. We are not too early to begin serious study of the manned exploration of interplanetary space. When you consider that the time lapse, from the conceptual studies of the new launch vehicle to operational readiness, it considered to be approximately 10 years, we are definitely not early at all. Von Braun, speaking at a time when we’d barely been able to send one person into orbit and 5 years away from sending Neil Armstrong to the Moon, clearly believed that Mars missions were no more than 15-20 years away. He envisioned the progression that many still have today: Earth orbit to Moon to Mars. If only it were that simple. 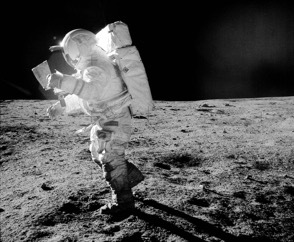 It is worth noting that the destination debate was vigorously alive in the Apollo decade but kept in check, hence keeping the nation focused on going to the Moon, by the inspiration goal set by the late President John F. Kennedy and the political will to honor the goal (of a very popular, assassinated leader). For many, the choice destination for humanity is as obvious as a full Moon on a clear summer night—the Moon. It's close enough that we can reach it in a matter of a few days, as was demonstrated conclusively the Apollo missions. Going back to the Moon will surely be easier and more affordable now than it was when we went in the '60s. There is still a great deal to learn about the Moon scientifically, and potential commercial interest seems to be high. And when you compare the cost and complexity of a return to the Moon with a mission to Mars, it is clearly the more affordable option. The above summarizes the beliefs of many in the pro-Moon advocacy groups. And they’ve had pretty good success in convincing our politicians that this is the best course of action. Both Presidents Bush directed NASA to develop plans for a return to the Moon, and Bush 43 actually redirected much of the space agency to start developing the rockets and systems necessary to make it happen. Unfortunately, neither was able to garner enough political support for their plans to endure beyond their terms in office. 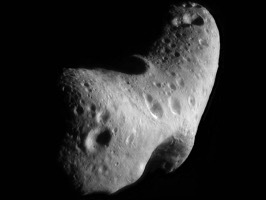 After President Obama assumed the presidency, NASA was redirected away from the Moon toward asteroids and Mars. As implied by Wernher Von Braun, Mars is seen by many as the ultimate twenty-first century goal for human exploration. It is the most earthlike of the terrestrial planets, has liquid and frozen water, and might have at one time been an abode for life. These attributes make it an interesting destination for science, exploration, development and eventual colonization. Unlike the Moon, we can actually envision ourselves living and working on Mars—one day, perhaps, terraforming it to become a second Earth. The problems are distance and time. Getting a human crew to Mars with any imaginable near-to-mid-term propulsion technology will take approximately nine months. Including time spent on the surface and the return trip, any crew will spend 2.5 to 3 years away from home in deep space as they journey from Earth to Mars and back again. It will require many rocket launches to assemble the ship and to load it with propellant and supplies. Launch windows that allow us to get there in a reasonable amount of time open only once every 26 months. The logistics for a Mars mission are far more extensive and complicated than for a trip to the Moon, or even for maintaining a Moonbase. Mars may await our arrival in the flesh; we’ve been there for nearly a hundred years in fiction. Edgar Rice Burroughs took his readers there in 1917 with the publication of A Princess of Mars; H.G. Wells brought the Martians to us even earlier—1898 was the year The War of the Worlds was first published. Finally, Andy Weir took us on a realistic journey to The Red Planet in his book, The Martian and in the film of the same name. None have made going there seem easy and, unfortunately, it isn’t. 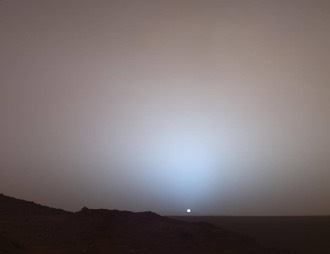 (And, equally unfortunately, it is impossible to list all of the great books written about Mars within the constraints of this article; so please accept a nod to a few that stand out: Red Mars (Kim Stanley Robinson), The Martian Chronicles (Ray Bradbury), and, simply, Mars (Ben Bova). As I wrote in a previous Baen essay, (Using Outer Space to Improve Life on Earth) there is another option: forgo sending people beyond LEO until after we build a network of space-based solar power stations to provide carbon-free green electrical power to the Earth, allowing us to wean ourselves from coal and oil and establish a space-based infrastructure that can then be used to perform more affordable exploration of the Moon, Mars or asteroids—effectively putting on hold any deep space exploration until after some pressing needs are addressed here at home. Table 2. The relative “doability” of various possible destinations for human exploration in terms of complexity, cost, return or technical difficulty. The sideways arrow ( ) indicates “neither high nor low,” the down arrow ( ) indicates the attribute trades unfavorably as compared to other destinations and the up arrow ( ) indicates it trades favorably. More seriously, we, as a community, have had problems articulating the answer to the “why?” question in a manner that builds political support. It is an unfortunate fact that government spending on space is pitted against defense, social entitlements, medical care, etc. When a group advocating a particular destination criticizes another destination, they are only providing ammunition to the critics of all space exploration—a potentially fatal endeavor that the community has been practicing for decades—to our detriment. And that raises the latest issue that has divided us: the false dichotomy that pits government funded space exploration against that which is privately funded. I used the word funded with intentionality—when the U.S. government launches a satellite, it does so by buying a commercially available rocket from a company like Boeing, Lockheed Martin or, more recently, SpaceX. Even NASA’s new Space Launch System (SLS) is being built of parts made by commercial space companies. Space launch is now inherently commercial and has been for years. Sure, there may be one or two ultra-wealthy individuals who can afford to fund their own excursions to the Moon, Mars, or an asteroid, but do we really want to have our space policy and future 100% dependent on the largesse of one or two people out of the world’s seven billion? Space exploration is, and will continue to be, a public/private partnership with ever changing roles and responsibilities. This is a highly visible battle that need not be fought; like the Mars/Moon/Asteroid debate, it only serves to provide the opponents of space development with more ammunition. How many remember Beta versus VHS? Cassette versus 8-Track? Mac versus Windows? How about IOS versus Android versus Windows Phone? In the commercial marketplace, standardization decisions, the rough equivalent of the space community’s need for a common, standard destination, is often resolved by the votes (money) of millions of consumers. It took time, and the winning and losing companies behind the competing standards spent millions of dollars trying to outsell their competition. Some won and others lost. In the “marketplace” for extremely expensive , multi-year projects (government or privately funded) there won’t be the luxury of having space systems to take people to and from competing destinations funded for years, across many election or quarterly report cycles, with the more viable destination’s space system “winning” in the end. There simply isn’t the political will or near-term financial incentive to sustain such spending. And, so far, none of the groups advocating specific destinations have been able to elucidate the “killer argument” for their favorite locale that wins this seemingly endless debate. Nor, in my opinion, will any be likely to do so. All are worthwhile destinations; and, given limited funding, not all can be funded. Even if going to any of the possible destinations is a government/private partnership, whatever plan is put in place will have to be supported and funded for years to come to fruition. Unity of purpose and advocacy are needed if we are ever going to again send people farther into space than Gene Cernan and the crew of Apollo 17. Now, where did I put my Beta recording of 2001: A Space Odyssey? Convene a nongovernmental study group composed of noted space advocates from different organizations and space advocacy groups, academics, space policy and international law experts, scientists, engineers, interested investment bankers and venture capitalists, and private space companies for a focused study and debate leading to a nonpartisan space policy recommendation for the next U.S. president. It is inevitable that not everyone on the team will get what they want, but it is imperative that all participants support the consensus product, and destination, whatever it might be. Continue the public debate, perhaps with one group siding with a particular political party and another with the loyal opposition. And then let the election decide everything, at least for another four years . . .
Continue the public debate with each side influencing government policy makers, private companies and multibillionaires ad hoc, with no agreed upon single destination and letting the best idea win (and get funded . . . or not). Encourage the government to implement Item #1 instead of it being done organically without governmental oversight. Some great idea, of which no one has yet thought, gets the entire space advocacy community together and united behind a common space vision. Nirvana anyone? Just remember that the longer we talk and debate, the longer it will take us to become a solar system-wide civilization debating the next great destination: which extrasolar system to explore first . . .
Les Johnson is a Baen science fiction author, popular science writer, and NASA technologist. He has science fiction novels set in three of the destinations discussed: Rescue Mode (a novel of Mars exploration), Back to the Moon, and On to the Asteroid. And he has one nonfiction book that deals with the fourth: Harvesting Space for a Greener Earth. To learn more about Les, please visit his website at www.lesjohnsonauthor.com.